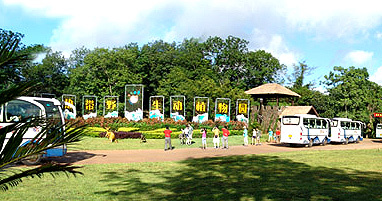 The first large tropical wildlife and botanical part of China, Hainan Tropical Wildlife Park and Botanical Garden, covering more than 5000 mu area and collecting not less than 4000 rare birds and animals including 200 species, located in Dongshan Town Xiuying District Haikou City (12 kilometers away from the intersection of East-Expressway) and Golden Tourism Area of Northern Hainan Island which with advantage in traffic. Diversity tropical valuable, rare and endangered animals, tropical economical forest, tropical beverage forest, tropical followers and fruit forest spread all over the garden; Jiaosha Banyan, trial, bines and other local plant stand every where. It is a typical tropical rain forest which has 90% covering rate of tropical forest and the sole tropical rain forest Wildlife Park and Botanical Garden and characterized as an island garden in China. A romantic and race crossing love happened in the park, the “King of Forest”, Northeast Tiger from China northeast immense forest fall in love with the “Overlord of Grassland”, Africa Lion from Tropical Grassland of Africa. Moreover, they have two famous half-breed babies named “Pingping” and “Anan”. How the two guys be worthy of the treasure of Hainan province and the No. one of China after one by one crucifixions? Here, you will find the answer!  The largest Bird Garden which characterized by high span without supporting, network structure and super-large area.  It is a basement of National Popular Science Education and Science Education of Hainan Younger; (Letter of Certification and Pictures), also the second classroom to know knowledge of wildlife and plant and enhance their recognizant of zoological environmental protection. Tropical Rain Forest ・ Flamingo Restaurant, located in the Central Service District of Hainan Tropical Wildlife Park and Botanical Garden, it is pleasant place for rest and sight seeing, covering 1600 cubic meters area and having the ability to contain more than 600 person per time. 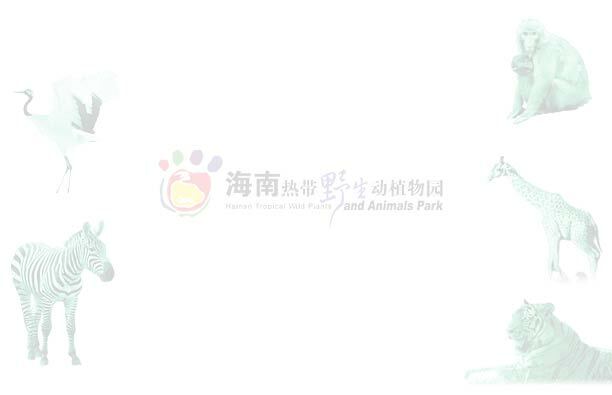 Sincerely invite you to Hainan Tropical Wildlife Park and Botanical Garden, sprinkle the secret purdah of tropical rain forest and feeling its special charm to enjoy zero touching with nature of tropical rain forest and happy traveling completely. Devote yourself in green world and take a deep breath in green sea.